with items found at any craft store. I’m starting to believe that spring might actually be here. The snow is melting, the temps are warmer and the days are way longer. 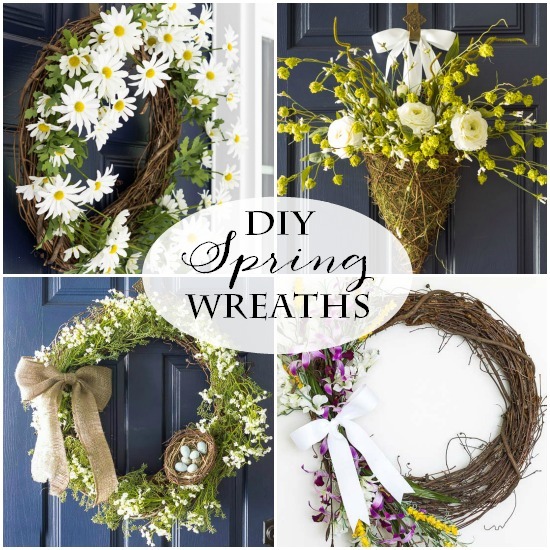 I also thought you might like to make something other than a round wreath for your spring front door. I would hate for us to get in a rut! I found a little grapevine basket at Hobby Lobby and decided to see what I could come up with. I’ve listed as many sources as I could find at the end of the post. 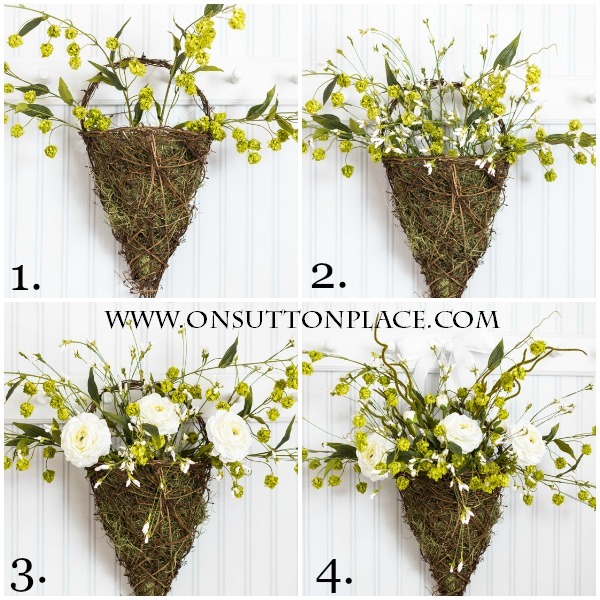 3 types of faux flowers. To get started I stuck a piece of floral foam down into the basket. You don’t have to go all the way to the point…just wedge it into the cone. Next take pieces of spanish moss and cover the floral foam. I literally just poked it down in clumps. To get to the bottom of the point I used the handle of a wooden spoon. 1.) Now it’s time to add the flowers. 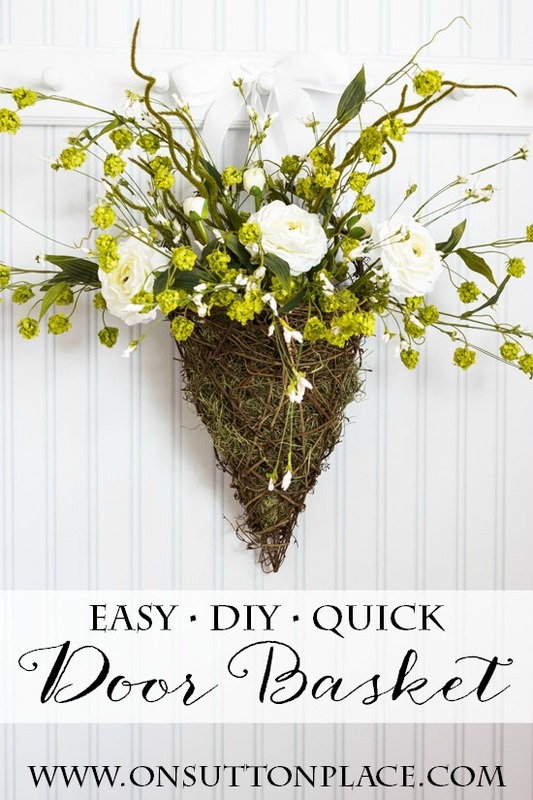 The look I was going for was light and airy…so I chose stems of green flower balls that sort of bopped around. That’s what I stuck in first. 2.) Next I added stems of tiny white buds. These were also very flimsy so they swayed around a little too. 3.) I love ranunculus. I found some white stems at Hobby Lobby and since they were half price, I splurged and bought three. I added those next. 4.) At this point it wasn’t quite as full as I had imagined so I added some more green flower balls. It always helps to hang what you are working on, stand back and then see what it needs. When I hung the finished basket on my front door, it was way to high. I looped a long piece of ribbon on the basket handle and just tied it onto my wreath hanger. Here’s a little sneak peek at what the basket looks like on my front door. 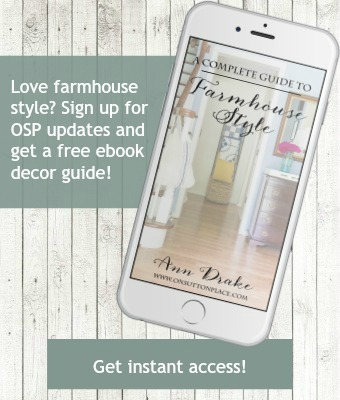 Click to see more of my Easy Spring Porch Refresh! Hi! This is so pretty. :) I love your tubs so I went back and read that post. Did I miss where it was that you picked those up? I know it’s been a while but I wasn’t sure if that’s something that can be found at your run-of-the mill big hardware store. Thanks! Love the cone basket. I have had two and never used them this way. Today is the day! Thanks for the inspiration and direction! I miss the little bird also! Gorgeous! Love your blog! Thanks for such great inspiration! Thank you for the lovely idea, I just created my own version today & I love it! 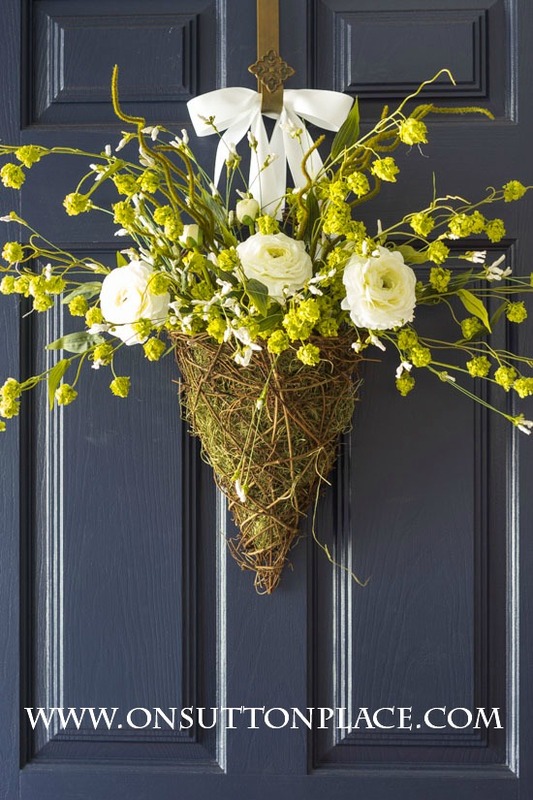 I made a similar arrangement over the weekend for my front door using an old sap bucket filled with freesia and ferns. When I looked out yesterday (my front door is glass), a bird had made a nest in the back of the bucket! I guess I’ll have to leave it for awhile! Love the Spring Door Basket! Why limit to only wreaths? I recently found a grapevine cross, added some of my existing Dogwood branches, some of last years palms, (Catholic as I am), added a flowing purple ribbon and my front door is ready for the Spring/Easter Season! Love your posts and blog! Gorgeous! I need to get something on my front door, as I do believe spring has sprung here in NC. Ann, That is so beautiful. Thank you for being such an inspiration. Love the door piece. I will definitely give this a try. Love this Anne! Such nice change from the expected circle wreath. I’m pinning and sharing on FB! Ann, I can’t tell you how much I LOVE your blog. I’m mostly a wishful crafter- but you’ve given me much needed confidence. Wonderful ideas and directions!! Thanks a million. Absolutely lovely! And so simply and beautifully done. Thank you for sharing. Very cute. I really like the ribbon add to. And the assorted spring blooms. Keep inspiring me! You are right it would be nice to have a change,and i really like your change,it makes a lovely hanging for the front door or even a front wooden gate. Thanks Ann. I LOVE it! I think the ribbon just makes it. This is so beautiful for spring, I may just have to visit my local Hobby Lobby and see what I can put together. Beautiful! Nice change from the round wreaths. Can’t wait to do it. I love this idea! So nice to switch it up from the same old wreath! thanks for the inspiration. Love the look. Nice variation to the wreath. We have a similar idea on our door using an umbrella. Thanks for the inspiration. Will try it perhaps after our rainy season ends. Charming, a beautiful way to greet a guest. You are always creative & inspiring Ann. Thanks, Ann. Easy, step by step pictures make this doable for me. The unstructured look is my favorite…very natural and pretty. How pretty! I love the shape of the basket. Love my clay birds, they are soooooooooooo darn cute. Perfect and tasteful as always! Beautiful spring wreath Ann, and the ribbon touch sets it off. I’m so glad our temps are getting warmer. Im going to spend today finishing in the herb garden before the temps dive down again for the week :( Not looking forward to the 30’s again. Ann, You never fail to excite me to try something new. Love the beauty of you uncomplicated ideas. Thank you for sharing. Very nice door wreath and thank you for the steps and visuals. This is a wonderful and fresh addition to any door. I know what you mean about Spring, we are just getting out of a five day rain cycle here and before that it was snow and ice. Spring is definitely welcome around here. front door is berry red. I love the light and airy look, perfect for spring. That is so elegant & fresh. This is one I am going to do! Thank you, Ann. I think the white bow was the perfect touch! Beautiful and springy!! Thanks for sharing! Such a beautiful Spring wreath, Ann! I’ve already got a door basket, and Spanish moss, just need the flowers, foam and ribbon. I’m definitely giving this one a try ;) Thanks for all you do!